100 million sharks are being killed for their fins each year – only because shark fin soup is a delicacy in some Asian countries. 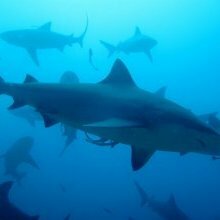 Sharks and rays desperately need more protection from international conventions such as CITES and CMS, if we don’t want them to disappear from our oceans. For sharing tools and video embed code, click on the video title in the YouTube viewer. Available from IFAW’s media library. Preview our collection below or sign up to our library to review and download our "best of" collections on www.ifawimages.com.